This image was entered in the January/February 1998 Internet Ray-Tracing Competition for the theme of Great Engineering Achievements. This has been my most detailed image to date, and now my best received. This image was awarded Honorable Mention for Concept/Interpretation of the Theme, and rated about seventh overall (out of about seventy). Be sure to notice the link to "View previous rounds" on the IRTC page, or you may miss the hundreds of incredible submissions that reside there! 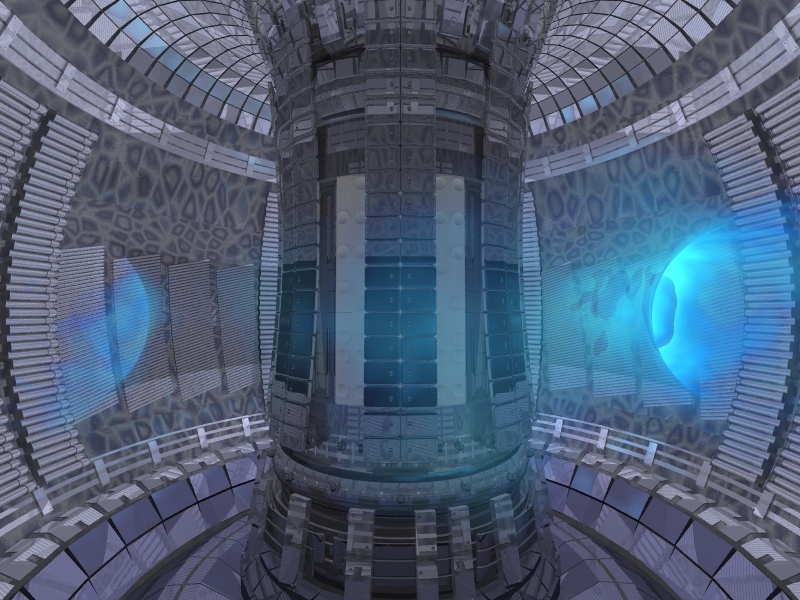 With this image, I was trying to show a fairly realistic view of the inside of a running fusion reactor. The blue band of plasma is the source of energy, where the fusion takes place, releasing energy at an atomic level. The plasma is suspended in place by a strong magnetic band, which keeps the (extremely hot) plasma off of the faces of the tokomak. This image was inspired by the Joint European Torus project. I gained the permission of that organization to use their images in this process, since everything on those pages is their intellectual property. This image also won Honorable Mention for concept from the IRTC.